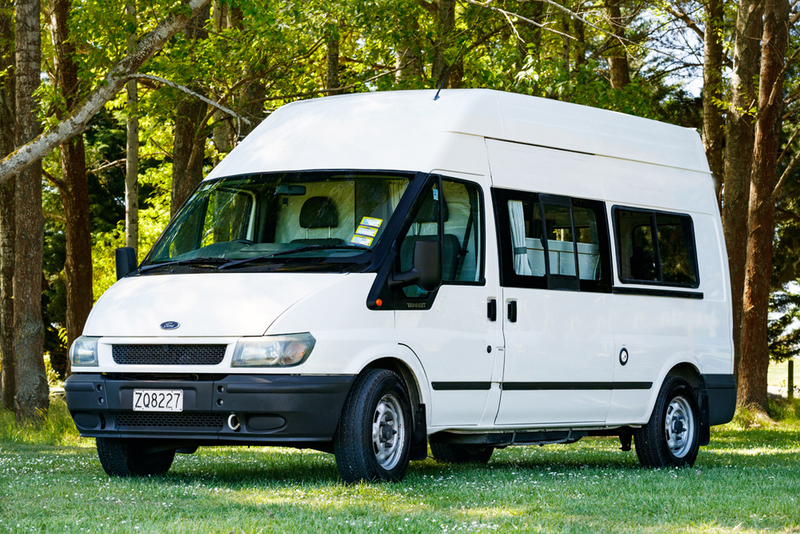 It’s amazing that so many extras can fit into one vehicle, but with the Budget Seeker campervan, travelling New Zealand couldn’t offer more comfort or freedom. 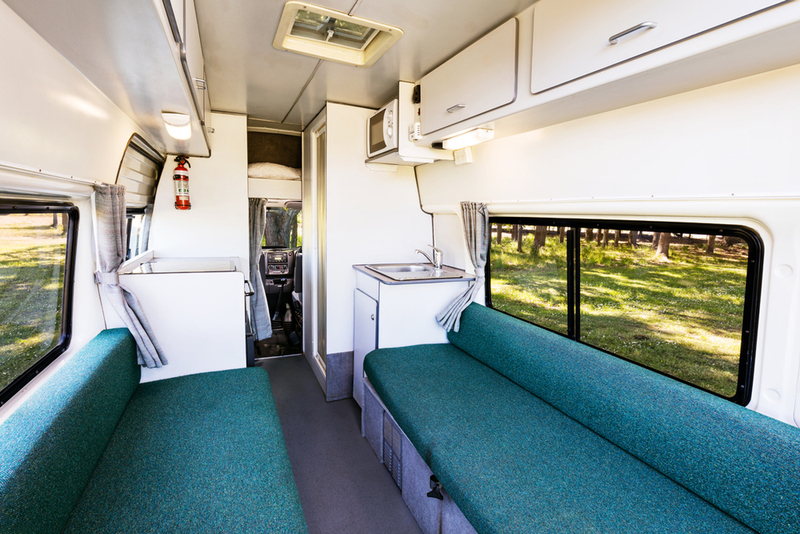 Generously designed for two people, this spacious vehicle features pressurized hot and cold water with shower and toilet. Cooking is made easy with a gas stove, microwave and fridge. Crockery, cutlery, linen, towels and more are all cleverly packed away on board. At the end a day the dining area converts into a comfortable double bed, your clothes can hang in the wardrobe and you’ll wake up in refreshed for a new adventure. 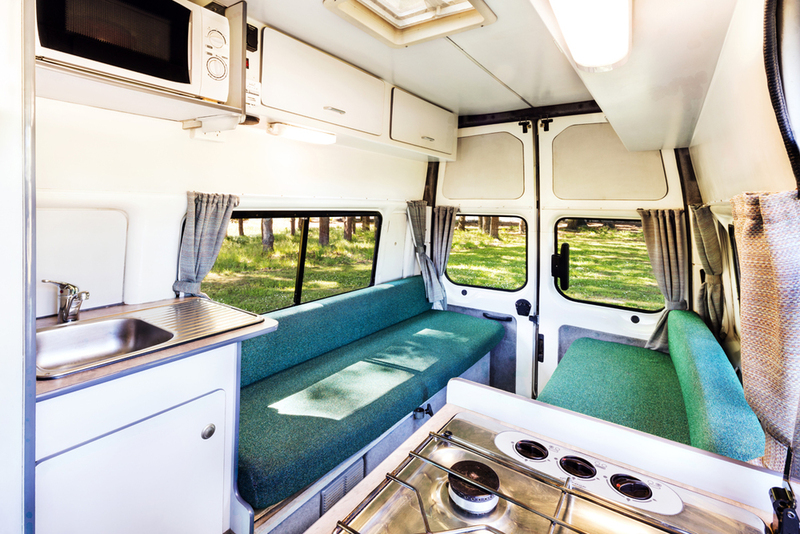 The radio/CD Player makes for enjoyable driving and when you’re ready for a break, just pull over in one of New Zealand’s scenic spots and enjoy some more of a magical adventure holiday. Baby Seat:Baby seats cannot travel in these vehicles due to front passenger airbags. Radio/CD: Speakers only in driving cab. Fuel Consumption: Approximately 7 km per litre, 14 litres per 100 km. Engine Specifications: 2.4 litre, diesel turbo. Tyres: Tyre pressure should be checked regularly. The recommended pressure is 55 psi. Spare Tyre: The spare tyre is located under rear of the vehicle. External access only. Tools: The tool kit is located under the drivers seat. Sleeping configuration: One double bed (1.95m x 1.75m). Gas Bottle: 4.5kg bottle. Bottle has an 'ON/OFF' tap on it. Please ensure it is in 'OFF' position when not in use and when driving. Fresh Water Tank: Capacity is 70 litre/15 gallon. Grey Water Tank: Holding tank for grey waste water generated from the shower and kitchen sink. Disposable at all camp grounds and dump sites. Holds 70 litres/15 gallons grey water, and should be empty on drop-off. Bathroom Facilities: Hot and cold pressurised water in shower cubicle. Toilet: Located in cubicle with shower. Flush toilet waste goes into cassette holding tank that is accessed from exterior compartment door. Toilet is full of chemicals on pick-up of vehicle, with a small complimentary supply. Toilet cassette holding tank must be flushed out and empty on drop-off. Water Heater: Water heater works on gas and is operated by a switch. Water will be heated after approximately 15 minutes. Equipment provided: Crockery, cutlery, cooking utensils, pots, frypan, grater, chopping board,colander, potato peeler, salad/serving bowls, storage containers, toaster, kettle, teapot, coffee plunger, bucket, brush and shovel, sleeping bags or duvet, blankets, pillows, sheets, towels, teatowels, heater, electric jug, cloths pegs and line, fire extinguisher, toilet chemicals, LPG gas bottle, maps and camping ground guide book.